After posting a pic of store bought Chinese chicken noodle soup last week on facebook, a few people asked us if we would have a similar recipe we could share. 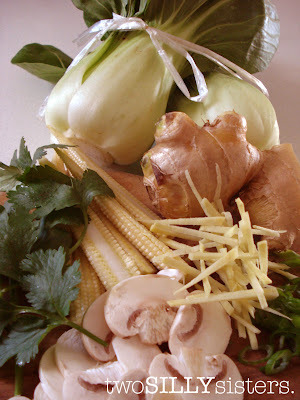 So here it is, our version of Chinese chicken noodle soup. It’s very easy to make and is perfect for a quick mid-week winter meal that the whole family will enjoy! 1. Cook the noodles according to the packet instructions and set aside. 2. Simmer the stock with chicken, ginger strips, garlic, baby corn and soy sauce for 3-5 minutes or until the chicken is cooked through. 3. Add the bok choi and simmer for a further minute or until just tender. 4. 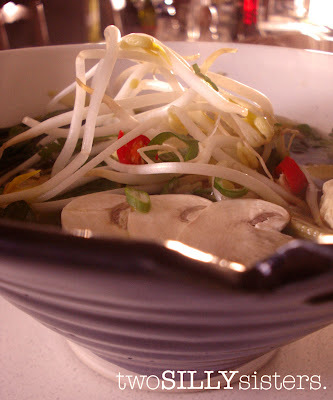 Divide the noodles and mushrooms between 4 bowls and ladle the stock, chicken and vegetables over the top. 5. Garnish with bean sprouts, shallots, coriander and chilli. Serve immediately. Tip: This soup can also be made with beef, just substitute the chicken stock for beef stock, and the chicken breast for beef strips.